Baked carrot fries tossed in a savory garlic, egg and Parmesan cheese mixture and baked to crispy perfection! The kiddos top favorite healthy snack picks! 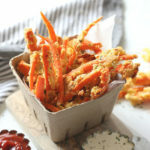 These baked garlic Parmesan carrot fries are the ultimate sports event television watching health food! In fact I was not even gonna really share it here until this past weekend my sister text me an image of her baked carrot fries while I was sitting in a fantastic hotel room on my “stay-cation” weekend! Well I wanted them. But there are no ovens in my hotel room! I got jealous of her gorgeous orange fries she text me. 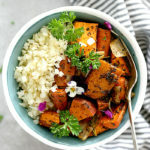 I wanted to eat them so bad I hopped on my computer to find this recipe and take her advice to post some healthy football food! Totally the ultimate healthy snack- right?! As the image of these carrot fries dipped in Parmesan cheese and garlic spices popped up on my computer screen, I started to drool… seriously. I love roasted carrots that much! My boys do too! First off, I love that she thought of me during Sunday football and secondly I love that she thought of me to recommend a delicious healthy football snack! She is so right too- forget the chips and fried foods for game-time, bake up those vegetables! I have made these baked carrot fries a few times and every time my boys devour all of them! They could not keep their hands off the fries during this photo shoot:-) Especially dipped in ranch dressing and organic ketchup. This fry recipe is super simple to make too. Just toss chopped carrots in a Ziploc bag with the eggs to coat them. Then mix the carrots in garlic, herbs, salt and grated Parmesan cheese and bake on a sheet pan until the cheese is golden crisp! It is a perfect appetizer for football season! Preheat the oven to 400 degrees F. Peel and slice carrots into quarter horizontal strips about 4-inches long. Prepare a baking sheet by lining it with parchment paper. In a small bowl whisk the egg. Put the carrots and egg in a one-gallon Ziploc bag, seal, shake and mix together until coated. In another bowl, mix together the garlic powder, salt, almond meal, parmesan cheese, parsley, thyme and baking soda. Add the egg and carrots mixture (from above). Mix well to coat each carrot with the almond meal cheese mixture. Spread the coated carrots evenly on the prepared baking sheet lined with parchment paper. Bake 10 minutes, flip the carrots and bake another 5-10 minutes. Garnish with parsley and serve with a side of organic ketchup or ranch dressing. Have you a sub for Almond meal? Live rural and would like to make these but Almond meal is not readily available to me. Yes, you can also use gluten-free bread crumbs (which does add grain).